Breathe Outdoors’ sole aim is to create a explorative space for you in a natural environment. We are a Outdoor Learning provider specialising in personal development, mental and physical health. Whether it is in the woods or on the water we will find an environment for you to take a moment and breathe. We offer a wide range of outdoor activities in various environments to encourage positive self-development and wellbeing. We combine the power of nature with recognised mental health practises, or as we like to call it exercising our ’emotional fitness’. We also offer more in-depth courses and workshops focusing on mindfulness. The outdoor locations for these courses are carefully chosen to inspire and create openness. My love for the outdoors began with family camping trips and hanging out of trees as a child. From then on I’ve been hooked on the outdoors and exploring all it has to offer. That passion has continued to fuel my career in the outdoor adventure industry beginning over ten years ago at University, studying Sports Science and Outdoor Adventure. 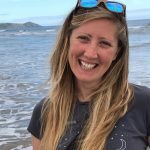 Since graduation I have continued to gain qualifications in multiple land and water based outdoor adventure activities and taught in Schools, Colleges and Outdoor Centres, working with people of a wide range of ages and backgrounds. Through the years I have been fortunate to travel to some amazing places and these experiences of being in nature, the sun on my face and the wind against my cheeks, have had such a positive, powerful effect on my life I’ve wanted to share that experience with others, and so the early concept of Breathe Outdoors was born. In 2016 I began my journey into the practises of mindfulness, meditation and relaxation qualifying as SMARTfoundations Coach (Stress Management and Relaxation Techniques). These practises have shaped my vision for Breathe Outdoors, which aims to marry the benefits of being outdoors, on an educational, personal, social and emotional level with the benefits of a more spiritual and therapeutic approach to life. More on the rest of the team to come! All Breathe Outdoors’ staff and associates work within National Governing Body Guidelines and are fully qualified; first aid trained, DBS checked and insured. Most of all we are passionate about the outdoors and love sharing that passion and experience with others. Our logo combines the symbolism of the lotus flower; purity, spiritual awakening, faithfulness and beauty with imagery of the sun and mountains, representing freedom and exploration, whether physical or psychological. These meanings are reflected in Breathe Outdoors’ ethos and values which we try to uphold both in business and life.